Livin' Out West ....: GO FROGS! 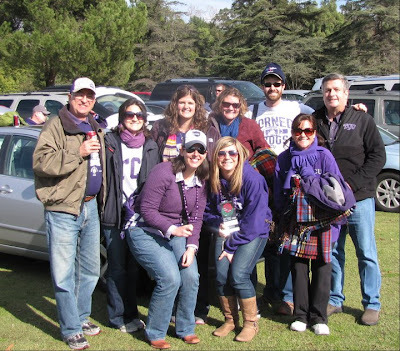 On Saturday I got to attend what was to me a pinnacle of watching lots and lots of TCU football my entire life. The Horned Frogs finishing an undefeated season by winning at the Rose Bowl. We sat through every home game of many loosing seasons, and that just makes this all the sweeter! Go Frogs! Go Frogs!! What a great game!! So glad you got to experience the excitement! Such an awesome day! Go Frogs is right! Awesome picture of the stadium. Doesn't look 70/30 to me...way to represent Frogs!